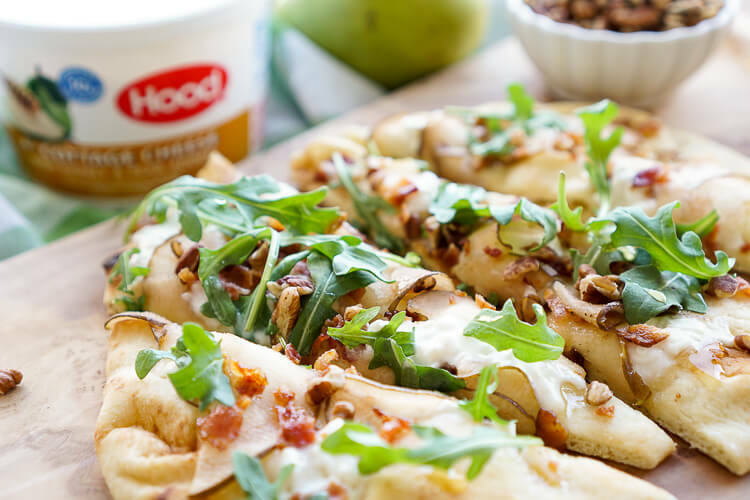 This Honey Pear Bacon Flatbread is the perfect light lunch, snack, or appetizer and just the slightest bit sweet! Save it to your LUNCH, APPETIZER, or SNACK board and follow Sugar & Soul on Pinterest for more recipes! For a period of my childhood, we lived with my grandparents. And while my dad and mom worked and my mom took night classes, I usually had most meals with my Grammie and Grampie. My grandparents were pretty old fashioned and the menu didn’t vary too much from week to week, there were always the staples at the dinner table: bread and butter and cottage cheese. I can’t even tell you how much cottage cheese I consumed as a kid, but it was A LOT! I didn’t eat as much cottage cheese during my middle and high school years and didn’t actually pick it back up until about a year ago. Did you know you can do so much more with cottage cheese than just eating it out of the tub? Not that there’s anything wrong with that, but we all like to try new things every once in awhile, right? 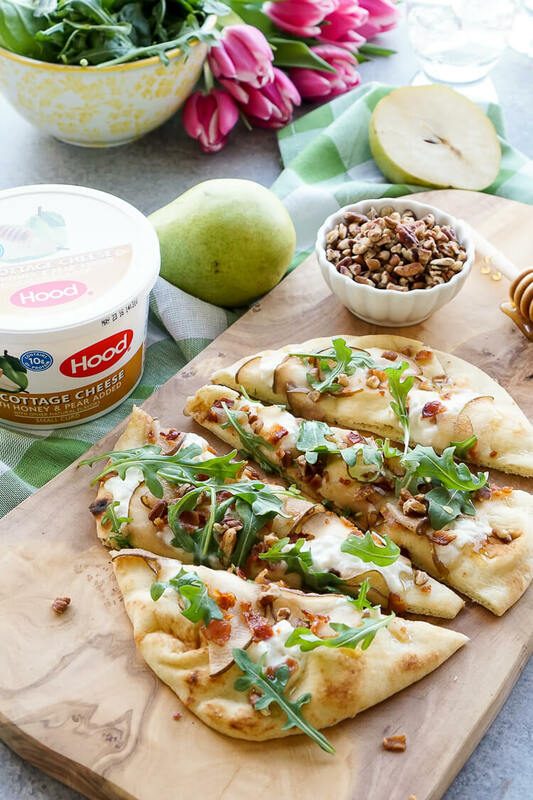 Speaking of new, I’m partnering with my friends at HP Hood to share this recipe using their NEW Hood® Cottage Cheese with Honey & Pear which mixes in crisp, delicious pears and subtly sweetened honey. 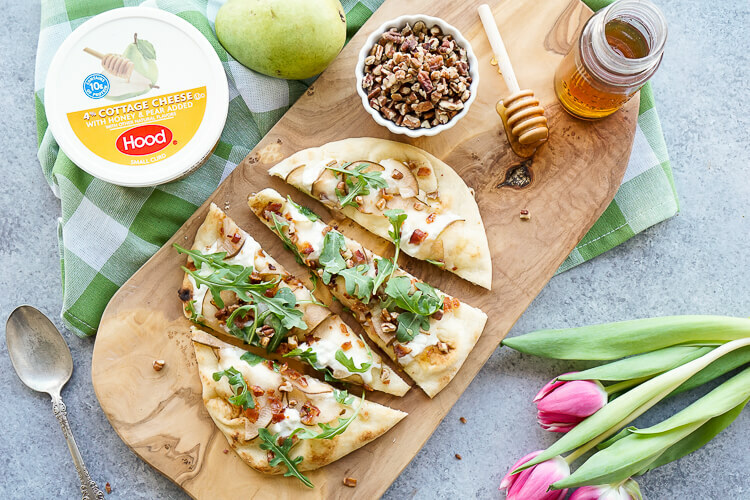 They’ve also launched Hood® Cottage Cheese with Maple & Vanilla that combines nature-inspired maple with creamy vanilla! So back to this recipe and the amazing things you can do with cottage cheese! Did you know that cottage cheese melts? I mean it’s cheese, so when you think about it, it’s pretty obvious, but the idea never occurred to me until last fall. Now I want to melt ALL the cottage cheese! It reminds me a bit of mozzarella when melted, which makes it perfect for pizza and flatbreads! 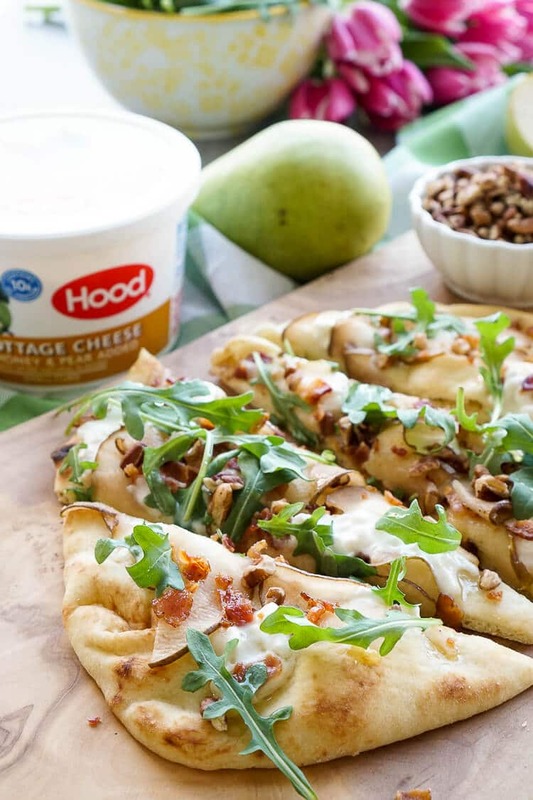 This flatbread recipe was inspired by the flavors of the cottage cheese itself, Honey & Pear! I love making flatbreads because they’re generally really light lunches, snacks, and appetizers. The key to a good flatbread is only cooking some of the ingredients and leaving the rest fresh so it adds a nice dimension to the dish! 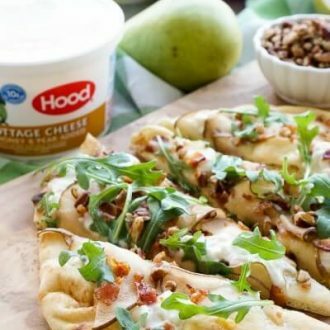 In this case, I used naan bread and added dollops of the Hood® Cottage Cheese with Honey & Pear, then added shaved pear slices, and chopped bacon and baked at 425 degrees F for about 6 to 8 minutes until the cottage cheese has melted. Then remove it and top with baby arugula, chopped pecans, and honey. 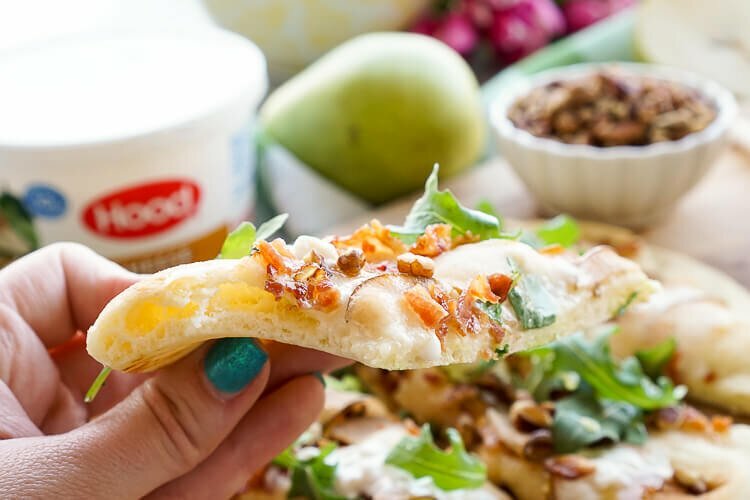 This Honey Pear Pecan Bacon Flatbread is the perfect light lunch, snack, or appetizer and just the slightest bit sweet! 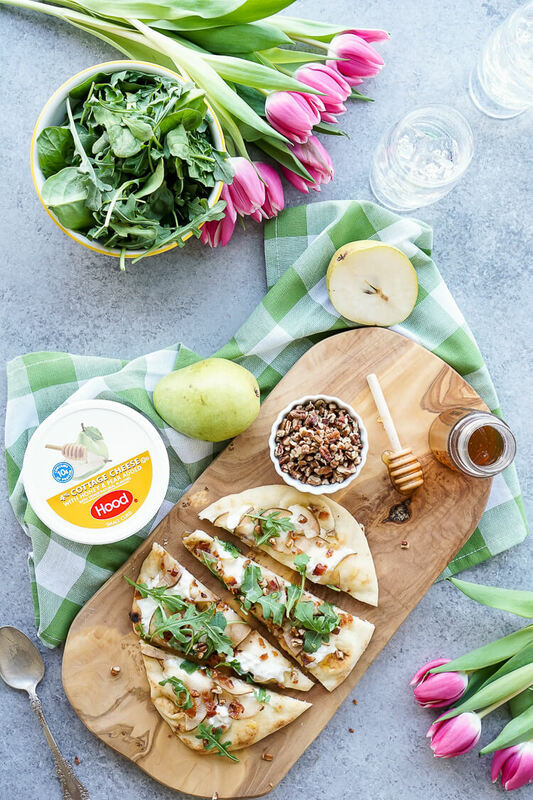 Brush naan bread with olive oil and dollop small spoonfuls of the Hood® Cottage Cheese with Honey & Pear on the bread. Use a vegetable peeler to peel shaved slices of the pear and add to the top of the naan, sprinkle with the chopped bacon. Bake for 6 to 8 minutes, or until the cottage cheese has melted. Remove from oven and top with baby arugula, chopped pecans, and drizzle with honey. Slice and serve warm. 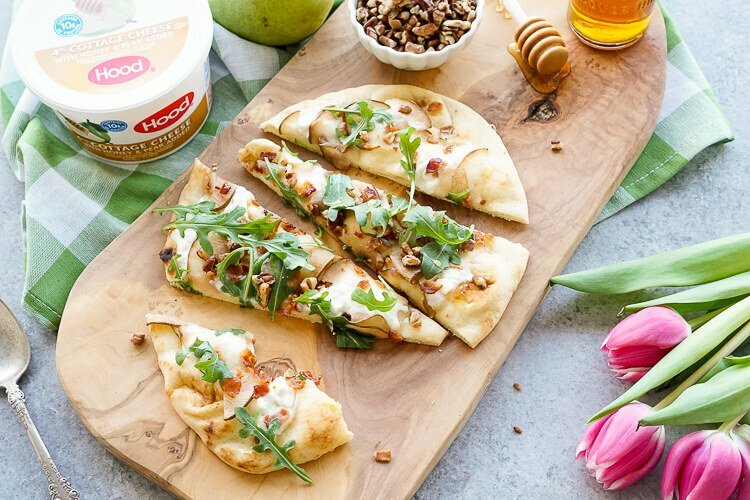 Whether morning, afternoon, or evening, these new Hood® Cottage Cheese flavors offer a healthy snack, ingredient or topping that lets you indulge your sweet cravings with less guilt. The new flavors are available in dairy cases throughout the Northeast at Shaw’s, Stop & Shop, Hannaford, and Market Basket. Which one are you most excited to try? Don’t forget to follow HP Hood on Facebook, Twitter, Instagram, and Pinterest! Check out their website for more great recipes and a product locator. What a perfect summer snack! I am pinning this recipe for later! I love using naan as a quick pizza crust. What great flavors you have going on. Me too, it makes it so easy! These flavors are definitely a great combo! I seriously had no idea that cottage cheese melts, time to give it another chance!! Right! Mind blown! You should try it out; you’ll be amazed at the possibilities! I eat a lot of cottage cheese – I’ll have to try this flavor. 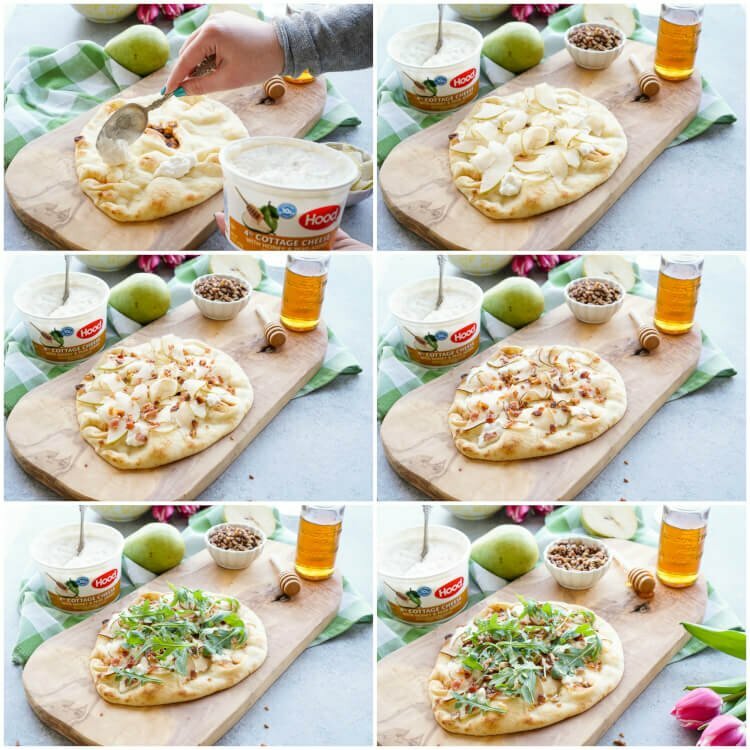 Your flatbread looks delicious! Thank you so much, Jill! You’ll love this new flavor, it’s got the perfect amount of sweetness in it! I would have never thought about melting cottage cheese! Game changer! It’s such a great bread with so many uses, you should try it out sometime soon and this recipe is definitely a great start!